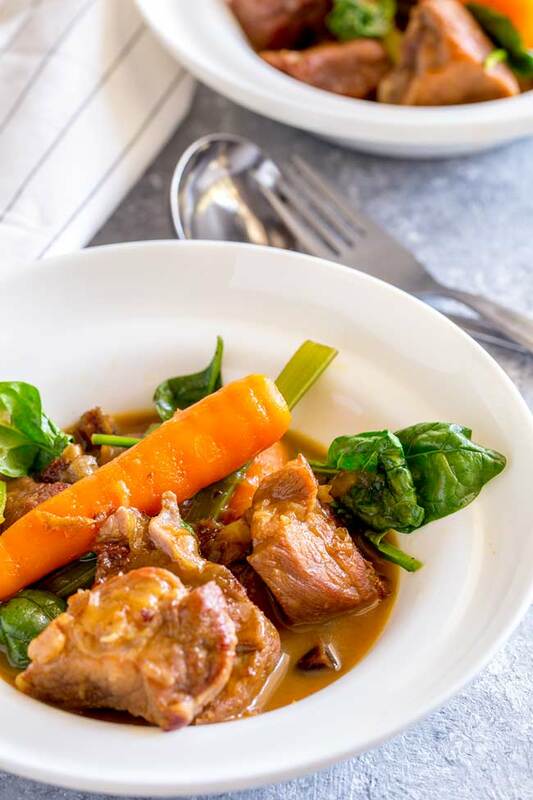 This Instant Pot Pork Stew with Maple Syrup is gluten free and paleo, which makes it a great dish to have up your sleeve when entertaining. But most importantly it tastes amazing! Plus it looks bright and beautiful and takes 30 minutes to cook! Winner winner pork dinner! Although this is called Instant Pot Pork Stew, it can obviously be cooked in other pressure cookers! I have tested it with the IP and with my stove top pressure cooker. Because of the higher pressure achieved by pressure cookers that go on the hob/stove, the cooking time is reduced. So instead of the 25 minutes it suggests in the recipe, cook the pork stew for just 20 minutes (This is detailed at the end of the recipe below). 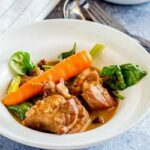 How to ensuring your instant pot pork stew has plenty of depth and flavor! One of the crucial steps to this pork stew is the browning of the pork. You want to ensure they have a really nice crisp sear to them, this not only gives up maximum flavour (all those yummy caramelised meat flavours) it also help the chunks of pork to stay together when cooked at high pressure. This means you don’t need any flour or thickening agents. The finely chopped onions break down into the sauce and naturally thicken it. 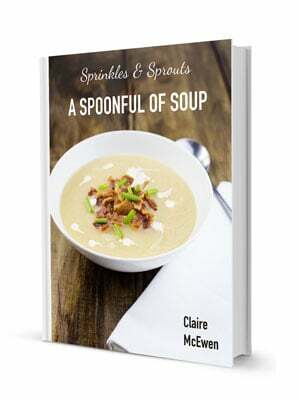 Perfect for celiacs or those following a gluten/wheat free diet! To make sure the veg stay bright and fresh they are added towards the end of the cooking process. This means they keep their shape and colour! I know I am a usually the first one to wax on about the benefits of adding citrus zest to your meals but DON’T add the zest of the orange to this pork stew. When you cook the orange zest under pressure it end up adding a bitterness to the dish! Because I am an appetizer fiend, I rarely start a meal without a little something. It might be something simple like a ball of homemade ricotta and fresh bread or something warm like my basil and cheese stuffed mushrooms. But either way there will be something to start the meal. With an appetizer this pork stew will serve 4 without any extra sides, but I am not one to ever risk my guests leaving hungry so I usually serve it with some creamy mashed beans. Or, if you aren’t worried about the gluten, add some crusty bread and a simple dessert! A lemon panna cotta would be perfect! 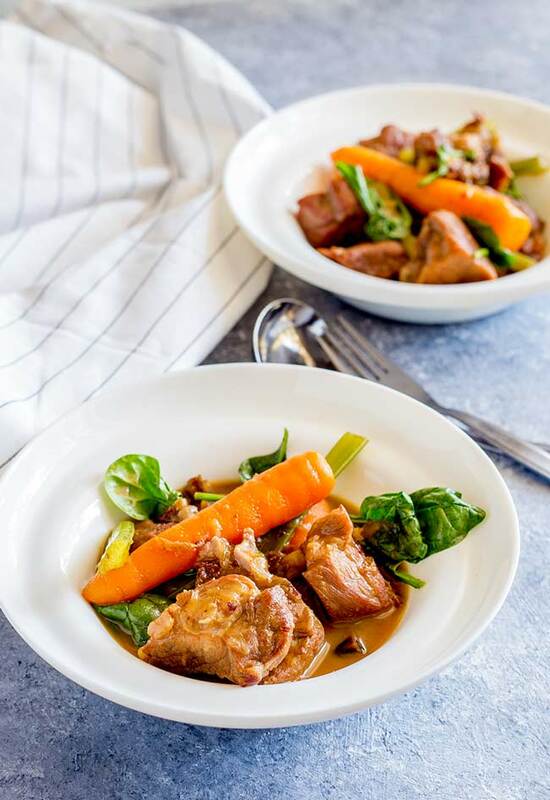 This Instant Pot Pork Stew with Maple Syrup is gluten free and paleo, which makes it a great dish to have up your sleeve when entertaining. But most importantly it tastes amazing! Plus it looks bright and beautiful and takes 30 minutes to cook! Instructions for Instant Pot (or other brand electrical pressure cookers). See Notes for stove/hob pressure cooker adaptions. Cut the pork into large 2 inch chunks. Stet the Instant Pot to Sauté and when it reads 'Hot' add the oil. Whilst the pork is browning finely chop the onion. Add the chopped onion to the Instant Pot, stir well then cook for 2 minutes until the onions have started to soften. Add in the maple syrup, stock, the juice of the orange and the chilli flakes (if using). Don't add any further seasonings at this stage as the stock has salt in and you won't be able to taste test as you cook. Once the stock and syrup mixture is simmering cancelling Sauté and placing the lid on. Set the Instant Pot to Manual and cook at high pressure for 25 minutes. Whilst the pork stew is cooking prep your veg. When the 25 minutes is up do a Quick Pressure Release. Add in the carrot, celery batons and chopped dates. Close the lid, press Manual and cook on high pressure for a further 5 minutes. Once the time is up do a Quick Pressure Release and stir in the spinach. Seasoning to taste and serve. Because stove/hob pressure cookers work at a higher pressure, the pork will need less cooking time. So give your pork 20 minutes and then a further 5 after you add the veg. Okay so first things first, hands up who remembers much of their high school home economics classes?? Actually I shouldn’t call it H.E! It was changed to Food Technology when I was at school! I can also remember the lesson when my Buche de Noel went totally wrong!!! As I removed my tray of cake from the oven, a friend was having a complete disaster with hers, with tears in her eyes she looked at me, so I went and helped roll hers. We fudged it together pretty well, but by the time I got back to mine, it was too late, the cake had cooled and there was no way it would roll. Chocolate Buche de Noel FAIL! BUT!!!! 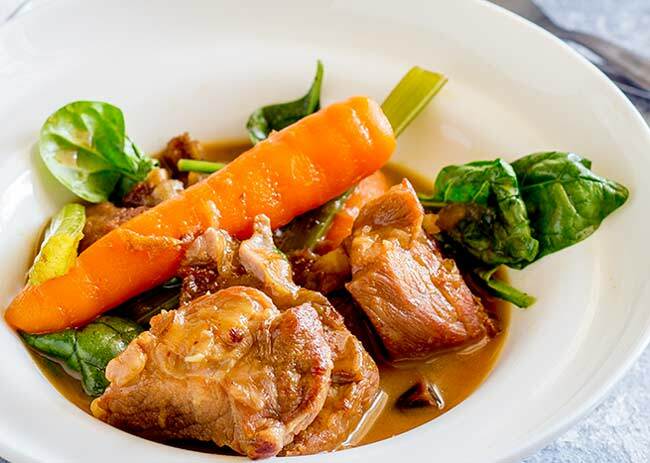 It is sort of relevant because Year 10 food tech was when I first came up with my pork stew recipe (cooked in the oven rather than a pressure cooker). The assignment was to design a one pan meal for a pregnant lady. Did you know that vitamin C increases your bodies ability to absorb iron? So cooking pork in orange juice and adding a healthy amount of spinach is perfect for someone who is pregnant or breast feeding. P.S This recipe first appeared as a guest post over at Red and Honey. 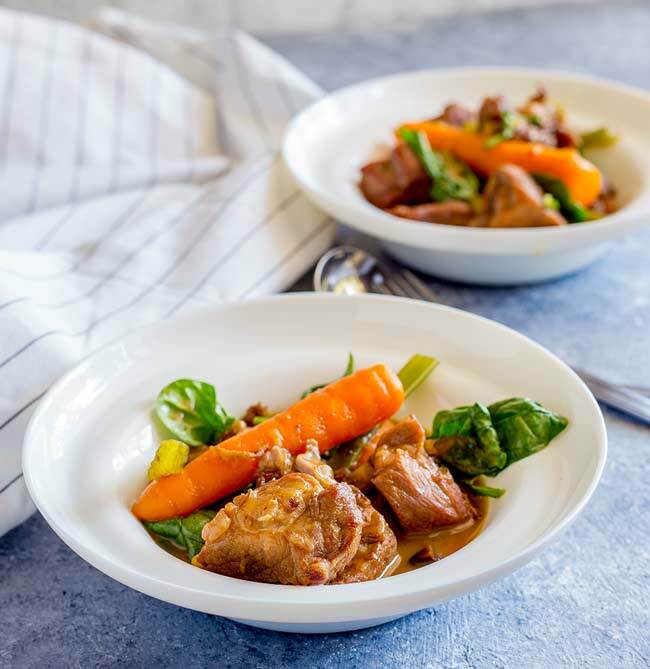 If you love food why not subscribe to my newsletter, I will drop you an email every now and then, just to say hi and send you a couple of recipes think you might love, like this Instant Pot Pork Stew with Maple Syrup.